Classroom Freebies Too: Tired of Cookie Cutter Research Projects? Tired of Cookie Cutter Research Projects? It's New Year's Day, and we will soon be heading back to our classrooms to start the new year with our students. It's an exciting time of year, but getting back into the routine of school can be challenging for students - and teachers. One way that I will work to end the post-break blues with my class will be by diving into our African American history unit. I always like to begin the unit in January so that we can display our beautiful work during the month of February. 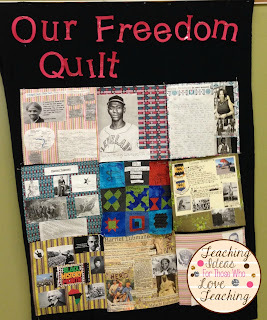 Each year, in addition to our in class lessons, my class and I create a freedom quilt of everyone's research. Most years, my class is large enough that we actually create two. I give each student a piece of scrapbook paper to create their project on (or dimensions, in case they want to create a quilt square out of fabric). Each year, I am blown away by the beautiful quilts we create.